Understanding Computers is not everyone’s thing. And if you have to teach someone a thing or two about computer then it’s like the scene from the “Battle Of Bastards” where after a heroic start you soon realize you are in deep s**t and find yourself praying for it all to get over quickly (sighs). I for one use screen recording software to teach a person how to perform some action on Windows PC. It saves me from frequent calls and attending to super long threads on a how to article. Even when I am stuck with some new software, generally I YouTube its tutorial video and save me from hanging myself from the mouse chord. If you too are in a similar situation, it will be a smart move to download and install one of the best screen recording software on your Windows PC. Screen recording software is also essential if you are looking for some side income from YouTube. 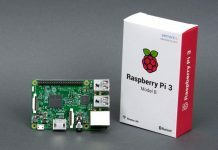 If you have a great understanding of computer software, coding, cracking(shh! ), etc., and you want to share the same with the world then I advise you must own one of these best screen recording software. Also, you may, from time to time, require screen recorder software to share your awesomeness and some WTF moments from favorite video games online. 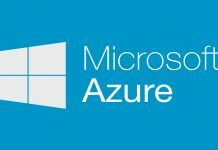 If you are finding it difficult to select the right screen recorder for Windows, I might be of some help for you in choosing the best screen recording software suiting your particular needs. What better choice can be to start a list of best screen recording software with one which is open-source and free to use. 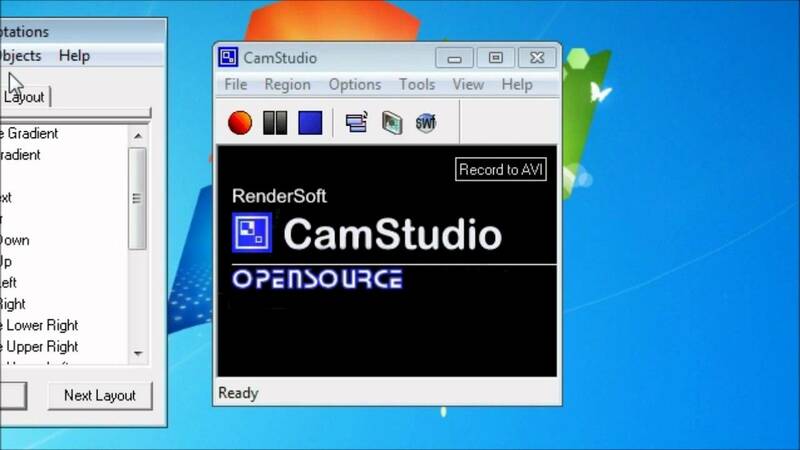 CamStudio is one of the most popular screen recorders in the community. It can record anything running on your screen along with its audio in .avi format. You can also change the sound of your recorded file with any other audio file of your choice. CamStudio also allows you to remove the cursor from the screen recording. It can also convert the recorded AVI videos into SWF. Other features of CamStudio include adding captions to video and recording picture in picture with your webcam along with recording your Windows PC’s screen. 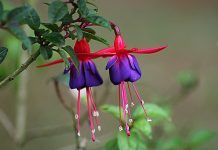 In spite of these many features, you will find that the interface is straightforward to use. And if you can’t understand a feature then you can always look at the help files. CamStudio also claims that its recorded videos are comparatively smaller in sizes than other similar screen recording software. If you are using older versions of Windows like Windows 2000, Icecream Screen Recorder is the best screen recording software for you. 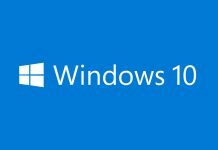 It can run smoothly even on the Windows 8 and 10. Its User Interface is one of the simplest you will ever find on any screen recorder. It supports hotkeys for you to turn on/off audio during screen recording. You can even record a live video conversation on Skype or other messaging websites with Icecream Screen Recorder. In addition to these features, it supports hotkeys, screenshots, timer, clipboard, history, video game recordings, etc. 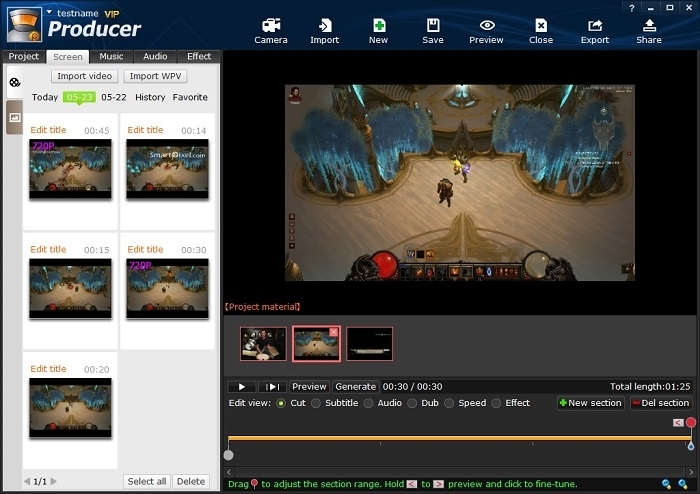 Icecream Screen Recorder also allows you to become creative by adding drawings, text, arrows, and editing the frame and size of the captured video and screenshots. You can also zoom in to focus on a particular part of the screen during the recording. 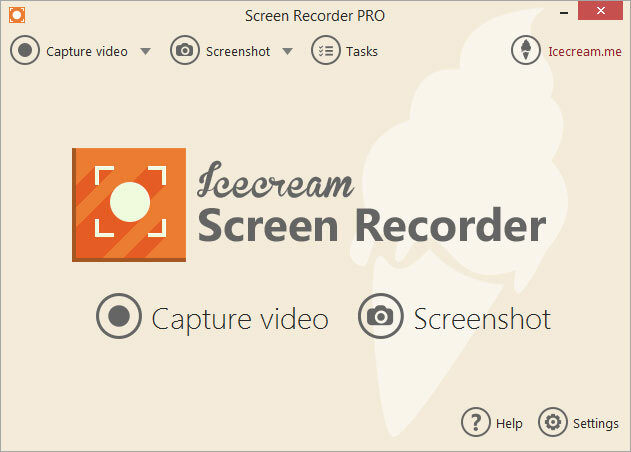 There are two versions of Icecream Screen Recorder– free and paid. With the free recording software, you can only record videos for ten minutes, and the recordings get stored in only WebM format. Of course, you can always convert WebM to MP4 online as well as using video converter software. On the other hand, the paid version of Icecream Screen recorder offers you exciting features like recording in various popular formats and without any time bar. The paid version also allows you to add your customized watermark to the recordings. Pricing: Free with limited features and the Paid version is available for USD 29.95 with unlocked features. Camtasia Studio is one of the best screen recording software with features like Green-Screen effects and in-video captions. Now about that green-screen effect, you can add your video into the recorded video to make it look like as if you are the part of the whole thing. There is only one word to describe its user surprisingly simplified interface– Professional. Camtasia can also perform cross-platform screen recording, and it offers integration with Google Drive. With Camtasia Studio you can add an external HD video into your screen recordings and generate YouTube like annotations for different contents. You can also import external video and audio files in the video from your webcam into your recordings. Pricing: Free trial for the first 30 days after which you will be required to pay USD 299 to purchase the license. Pro Tip: Check out the best video editing software to give a professional touch to your recorded videos. ActivePresenter is a multilingual screencasting and eLearning program developed by Atomi Systems. It is probably the best screen recorder for tutorial and education related videos. You can do anything on your screen with ActivePresenter ranging from PowerPoint presentations to online videos. It can make learning an interactive activity by adding annotations, voiceovers, and callouts to a recorded video. So when you click on an annotation during the presentation, it will redirect you to a different content which can be an explanation to a point in the video or an annexation to a step in a tutorial video. ActivePresentor is the best screen recording software for a corporate firm because of its support for SCORM. It can record videos in WMV, AVI, and other video formats. It has three different editions viz., free, standard, and professional. 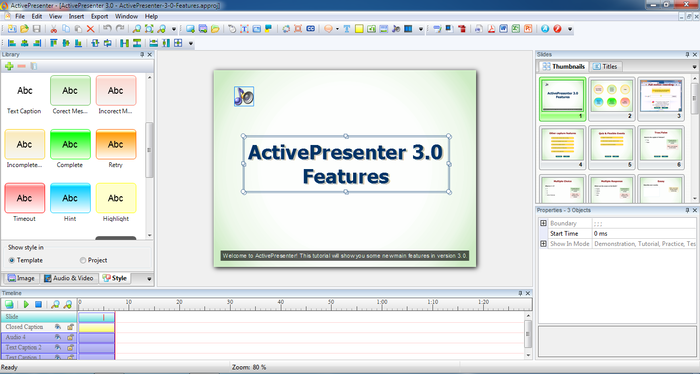 The free version of ActivePresentor is barred by watermarked video, signaling that it can’t be used for commercial purposes. Pricing: Available for Free(with non-removable company watermark), two other paid editions– Standard Edition is available for USD 149, and Professional Edition is available for USD 299. Snagit is developed by TechSmith which has also created Camtasia. But both the screen recording software have different and distinct features. Snagit is known by its users for its simplified UI, which comes with hotkeys for shortcut commands. Snagit allows you to set the capture area on your screen and take screenshots and record whatever runs on your screen. With Snagit, you can edit your videos by trimming and enhancing its quality. It allows you to focus on what you want to show people by in video focused zooming. The thing that makes it a part of this list of best screen recording software is that you can make GIFs out of your recorded videos. 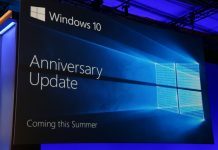 Other features include panoramic screenshots and scrolling captures, which lets you take the screen shot of whole page instead of the portion that fits in the window. Pricing: Free Trial, the full version is available for USD 49. Pro Tip: If screen recorded videos do not play in default Windows media player, try out the best and free video players from third-parties. 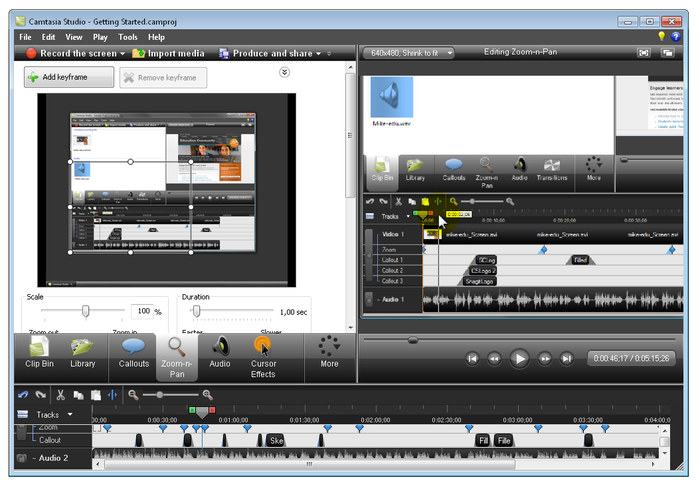 Ezvid, as the name suggests, is easy to use screen editor. It is also one of the best screen recording software which is open sourced and is available for free. 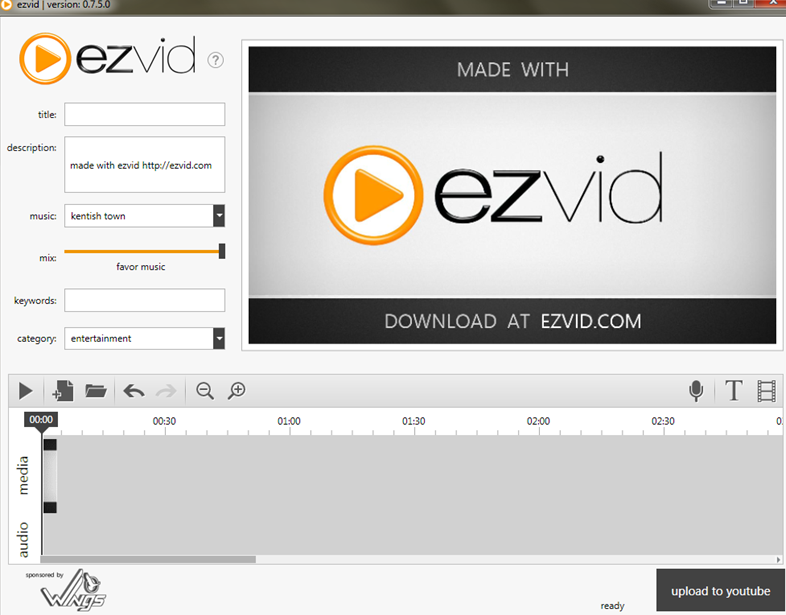 Ezvid is a software that can do both viz., record your screen and instantly edit the video to make it upload ready. Most of the beginner YouTube channels use Ezvid for creating their video. A video recorded with Ezvid can directly be uploaded to YouTube. It allows you to control the speed of your video and audio. Ezvid uses the processing power of the computer to speedily sum up the whole process. If you are compiling a list of best screen recording software then it is impossible to leave Screencast-O-Matic out of it. It is the personal favourite of millions of the budding YouTubers. You can record your screen and share directly your recordings to YouTube or even share it on a website hosted by Screencast-O-Matic. The free version of Screencast-O-Matic can record videos of up to 15 minutes only and contains company’s watermark. On the other hand, the paid version can record longer videos and comes with fully unlocked video editing tools. You can also add audio commentary to your recordings in the paid version and share it directly to Vimeo, Dropbox, Google Drive, etc. Pricing: Free with locked features. Unlock all features for USD 15/year. If I tell you that you can record everything possible from your Windows PC at a time by using just one screen recorder, would you believe it? Well, you have to because this is what ScreenFlow does. Also, you would immediately click the download button when I tell you that ScreenFlow comes with an integrated video editor. Hold your horses; these are not the only thing; you can also share your videos directly to YouTube and other social networking platforms. ScreenFlow also claims that videos recorded from it when watched through Retina Displays can yield one of the best video qualities. Other important features of ScreenFlow include Video Captioning, different video formats, and no time limit of recordings. If you are using the free version of ScreenFlow, then all videos will come watermarked with Screenflow’s logo. So if you want to use it for commercial purposes, it’s best advised that you buy the paid version. Pricing: Free (watermarked videos) and USD 99 for paid version without any watermark videos. SmartPixel is one of those best screen recording software dedicated to recording gameplay videos. SmartPixel is one of the best screen recorder featuring 720p(HD) video recording. However, you can also use it for recording anything running on your PC’s screen. So, it will suit you even if you are not interested in video games. Even though videos can be recorded in HD quality, it won’t end up leaving you hunting for more memory on your disk. The company claims to use a minimum of the space due to heavily compressed video sizes. You can also edit videos post recording and it allows you to instantly share or upload videos directly to YouTube and other Social Media platforms. Another thing that I liked the most about this particular screen recorder is that it can also add subtitles to the recorded videos and you can also dub the audio. Pricing: Free with limited function. Pro with unlocked features like a personalized definition, higher frame rate and without watermarked videos is available for USD 15.90/year. 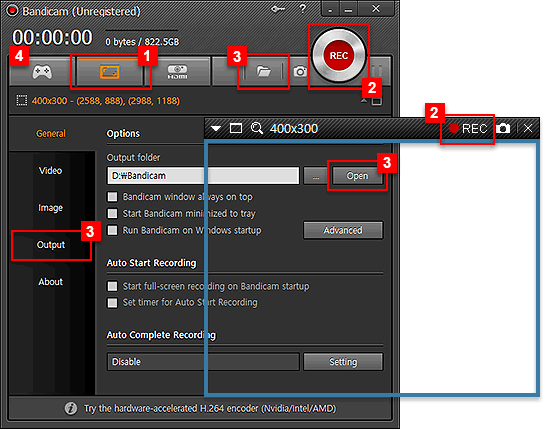 Bandicam Screen recorder allows you to record specific areas of the screen. You can record games, videos and virtually anything on your screen. Videos can be saved in either .avi or .mp4 formats. Along with your screen, you can record from your webcam and audio from your microphone in the real-time. The paid version also allows you to add your watermark. However, the free version videos will always have Bandicam’s watermark. You can also highlight a point on your screen with a mouse click effect during the recording. With Bandicam, you can also add animations and add your mouse drawn shapes to your video. The free version can only record videos up to 10 minutes. Bandicam can also optimize recording through hardware acceleration (if your processor supports it) allowing you to finish recording and processing with a faster speed. Pricing: Free with limited features. Paid and unlocked version is available for USD 39. Well, these were the top ten best screen recording software according to my personal opinion. However, if you think that I have left any popular screen recorder and it’s worthy of this list, then you can always comment below. Do note that some of these software are paid while others are completely free. If you are looking for the best screen recorder with profit earning motives, then I will suggest you go with the paid versions because they come with unlocked features. Also, it is advised that you should have a good video editor to add professional level touch to your recorded videos before publishing it.